What can coaches learn from positive psychology? There has been an explosion in interest in positive psychology over the last 20 years and, whilst many of the findings from this discipline found their way into the health, psychotherapy and psychology literature, little has crossed over into real-world coaching. A new study from the Erasmus University in Rotterdam has looked at the use of positive psychology in assisting with real-life coaching interventions. Following a review of the positive psychology literature, the researcher found that ‘positive coaching’ is emerging as a new coaching paradigm. This research briefing looks at a new (2018) study and review of research looking at how positive psychology is changing coaching. We have probably all had boring jobs and been bored at work or at other places and times at some point in our lives. What is boredom and how does it work? The psychology of boredom is anything but boring. Whilst not part of the mainstream organisational or psychological research, understanding boredom, particularly in the workplace, is useful. A number of recent studies have found that boredom in the workplace leads to lower levels of productivity, engagement and higher turnover intentions and is seen as a significant predictor of mistakes and accidents. A new (2018) study is focused on ‘state boredom’. State boredom refers to “the aversive state or condition of wanting, but being unable, to engage in a satisfying activity”. State boredom, therefore, means that an individual wishes to find something of value to engage in, but finds it difficult or impossible to move away from the overwhelming feelings of boredom and apathy. In particular, the aim of the research was to review the current research and thinking around state boredom and to conduct empirical research into this condition to see if there are useful predictors of state boredom. The results are particularly useful for managers, leaders, Human Resources and organisational development professionals. The problem with integrating evidence-based practice. The new study (2018) has taken a more personal and grounded theory approach to looking at the day-to-day issues that new practitioners face when trying to integrate evidence-based practice with their work. The researchers observed in some detail the issues that faced practitioners, when trying to embed evidence-based practice and integrate it with their current work. This research briefing will be really useful for anyone engaged in introducing or embedding evidence-based practice in an organisation. The idea and importance of leader-member exchange (LMX) has grown significantly in recent years, with steady increases in the publication of research year-on-year. Leader-member exchange refers to the quality of the dyadic relationship between a leader and each of the individual followers. Whilst it has already been shown that high quality leader-member exchange relationships lead to significantly more organisational citizenship behaviours (pro organisational behaviours that are voluntary and over and above those required by an individual’s job or role,) previous studies have suggested organisational job embeddedness may have a role to play in the relationship between LMX and organisational citizenship behaviours. As a result of the paucity of research around job embeddedness and its connections with leader-member exchange and organisational citizenship behaviours, researchers decided to look at the relationship between these three elements and how organisational job embeddedness impacts them. This research briefing will be useful to anyone who is a leader or involved in leadership development and coaching. The idea of LMX or leader-member exchange is that leaders and their individual followers form unique relationships, based on their different beliefs, values, attitudes, personalities and needs in a constant relationship building process. Additionally, these individual relationships are constantly being revised and influence the expectations, attitudes and actions of each party to the relationship. The idea of LMX, or the impact that the individual relationships between leaders and their followers have on each other, originated in the work of Dansereau, Graen and Haga in 1975. Initially called vertical dyad linkage, leader-member exchange has become a core part of the leadership research literature and understanding. A new study by a team of researchers a systematic research review around the impact of affect on leader-member exchange to find out the latest thinking about the connections between the two. In other words, the review of research wanted to find out the latest thinking about the impact that emotions have on leader-member exchange, or the relationships between leaders and their followers. The researchers looked at all the research in this area from 2000 onwards. Once they had removed low quality studies, repeated studies and irrelevant papers, they found 80 primary studies that matched the needs of this study. This research briefing will be useful to leaders and anyone engaged in leadership development or coaching. Whilst interest in leadership research remains strong, there has been little research around leader workplace aggression. A number of recent surveys estimate that approximately half of all US workers have experienced some form of aggression from their leader or manager, often in the form of verbal abuse, passive aggressive behaviours et cetera. The new (2018) systematic review of the current literature has just been published by researchers looking at the issue of leader workplace aggression. This research briefing is useful to leaders, human resources and anyone engaged in leadership development and coaching. What predicts technological innovation strategy change? Innovation, in any industry, is a lot more than some bright ideas or sudden insight by a series of gifted and creative individuals. Many industries and organisations have processes and systems for delivering innovations. Structured innovation, in any organisation or industry, aims to identify business, service and technological opportunities that can help to either provide a competitive advantage or help to improve the leadership, management, operations, performance or outcomes of that industry or organisation. One of the most vibrant industries in terms of innovation is the fintech or financial technology industry. A new study by a team of researchers looked at the range of strategies being used in technological innovations in the financial industry to see if it could discern patterns in those strategies… its could! This research briefing will be useful for anyone in the innovation or IT development space. Should job applicants display excitement or calmness? The importance of ideal affect. Displays of emotion in the workplace are interesting as it tells us a lot about the culture and acceptance of emotional displays within an organisation. Organisations are notorious for allowing certain displays of emotion and frowning upon others. What is and isn’t acceptable as an emotional display depends greatly on the organisational culture and, of course, the national culture within which the organisation is situated. Understanding cultural emotional norms is important for any employee, however, the organisation itself should have an understanding of the impact of which emotions are culturally acceptable. For example, in some organisations the cultural norm is to display the sense of being harassed, which increases stress. In other organisations, the norm is calm proficiency. Emotional display norms in cultural settings can have a significant impact on a range of organisational indicators, such as performance, turnover rates, mental health etc. A new (2018) study about to be published shortly by a team of researchers looks at how differences in emotion impact employment prospects. This research briefing and the idea of ideal affect will be interesting and useful to anyone involved in recruiting, but anyone interested in organisational culture and organisational development will also find it really useful. The concept of lean has grown from an operational set of tools to reduce waste and increase value into a complete management philosophy of excellence, that involves a range of other ‘soft’ factors, such as leadership, management, learning and engagement. Additionally, lean has spread from manufacturing into other areas such as services, health, aviation etc. During the evolution and growth of lean and lean principles, factors such as organisational learning and knowledge management have come to the fore. This developing notion of lean focuses very much on employee engagement and participation in the development of a learning culture, in which the employee has ’voice’ and empowerment and, in essence, drives the learning and organisational development agenda and process. The intention with lean is to reduce waste and increase value and efficiency through a continual learning process, whereby the employee, rather than the organisation, drives the learning and continual improvement. This development of an evidence-based, learning culture creates a direct dilemma and paradox for the traditional management consultancy firm and the organisations that use them. Essentially, lean is a call for organisations to become learning systems, whereby the organisation incrementally discovers how best to do things, based on their own unique situation and relationship with their customer, in a series of iterative processes. This means that the knowledge and thinking that develops inside an organisation is likewise unique and distinctive. Previous studies (2011, 2012) have found that management consultants, particularly the large consultancies, have grown rich by foisting largely standardised solutions on organisations. Essentially, they have been able to produce economies of scale around imposing a combination of standardised modules of knowledge and skills on and in organisations and companies. Further studies have found that management consultancies are not always great at evaluating their own performance and the organisation’s resultant outcomes. Lean presents a problem for management consultancies, as the organisation now develops and produces its own knowledge and know-how. As a result of this problem, management consultancies have moved to helping organisations implement lean. However, there has been little research conducted around the effectiveness of using consultants to do this. A team of researchers have conducted a review of the research into this paradox and come up with some interesting observations and recommendations, particularly around what management consultants can and cannot actually deliver around lean implementation. 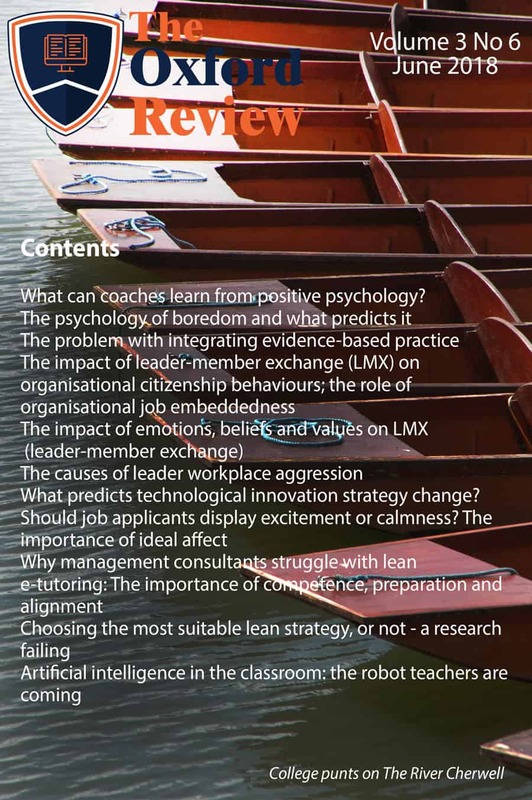 This research briefing is essential reading for anyone implimenting lean and especially management consultants working in this area. Over the last 15 years there has been an explosion in online learning, both within formal and non-formal contexts. The advent and development of the internet and online resources has brought about a significant shift in the way people access learning. As a direct result of this, formal learning organisations, such as universities and organisational learning and development functions, have found themselves competing with a plethora of informal online learning sources such as Udemy, YouTube, Future Learn and thousands of other learning sources. As can be expected, the range of quality involved varies considerably. A new study by researchers looked at the role competence plays in successful e-tutoring. The researchers both conducted a literary review of the latest thinking around e-tutor competence and conducted primary research across a population of 215 e-tutors. The rise of artificial intelligence and industry 4.0 is starting to have a very real impact on many areas of our life. A relatively new project called Artificial Intelligence in Education (AIED) underscores these developments, as researchers and universities develop new technologies to help us learn. This area of technology is advancing rapidly and a whole new class of robotic teachers are being developed to fully replace human teachers in the classroom. It is envisaged that Classroom 4.0 is potentially not that far away. The new study by researchers into robotics and artificial intelligence highlights recent advances in Artificial Intelligence in Education. This research briefing is a must for anyone engaged in learning and development, organisational learning, higher education or teach of any type.